Feeling a little dissatisfied with that old backyard swimming pool? Maybe you moved into a house that already had someone else’s idea of a dream pool. Or perhaps you installed the pool years ago when styles and standards were different. Maybe you never got the pool you really wanted because your installation budget was limited. Whatever the case, the cost of a major pool renovation is probably more than you want to pay (unless you like spending oodles of money). Fortunately, it’s possible to make some dramatic changes to your pool without spending a fortune. In fact, some updates can actually save you money in the long run by enabling your pool to run more efficiently. Here are a handful of swimming pool renovation ideas to consider if you’re looking to get the most bang for your buck. Of course, if your pool has serious structural or equipment problems that need to be fixed, there’s probably no getting around a costly renovation project. These ideas are aimed at making an outdated (but still functioning) pool look nicer and operate better with a minimal investment. If you have simple floodlight or other basic pool lighting, think about upgrading to LED lights. LED pool lighting is more energy efficient than traditional options, which at least somewhat offsets the higher cost of installation. Besides, there’s probably no cheaper way to transform an ordinary pool into a glamorous backyard oasis. LED lights can be installed below the water or anywhere in the pool area, and come in all different colors. They make it easy to add your own personal sense of style to your poolscape. LED lights can dramatically impact your pool’s appearance. While it’s not cheap by any means, resurfacing can be a solid way to use your remodeling budget. That’s because it improves the looks of your pool, while also serving the practical purpose of replacing something that wears out over time. 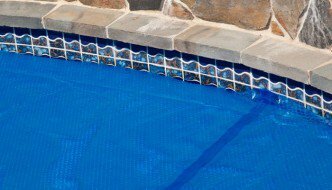 If your pool currently has a simple plaster finish, an update could also make your pool look more modern. These days, many people choose aggregate finishes that come in different colors and incorporate stones, shells, or other materials. Simply updating waterline tile can give your pool a more contemporary look. Combine it with deck and/or pool resurfacing, and you might think you have a whole new pool. But then, this article is about affordable upgrades, right? A major trend in swimming pools is the move toward salt water systems. These systems use salt to create chlorine in the water so you don’t have to add it via traditional methods. Many people report that the water in salt water pools is easier on the skin and eyes. Not having to buy, store, and handle chlorine is also a big plus. But the thing that makes this a cost-effective upgrade is the fact that these salt water pools are generally cheaper to maintain. While they might stretch your remodeling budget, things like waterfalls, scuppers, and sprayers are often pretty easy to add into an existing pool design. Thus, for a (generally) reasonable installation price, you can breathe some life into a lackluster pool area with motion and sound. Just be aware that water features can also increase the cost to maintain your pool by using extra electricity and increasing water evaporation (which causes cooling). If you’re going for practical updates, there are a whole host of features designed to make your pool less expensive to operate – many of which only recently became available. The main one to consider is a variable speed pool pump, which uses less electricity and may even qualify for an energy rebate where you live. Other popular options include energy efficient filters and solar-powered features (heaters, lights, etc). Pool technology is continually evolving, and a lot of the newer gadgets can easily be retrofitted to older pools. A lot of this high-tech equipment makes life easier for a pool owner, and could even enable you to fire your pool guy. Some things to consider include robotic cleaners, automatic pool covers, and all-in-one pool automation systems (some of which can be controlled through a smart phone).